Watching a kitten or a cat explore the world around them is a joy to behold. But for an unfortunate cat looking in a mirror for the first time and encountering the unholy magic of their reflection staring back at them, getting seriously confused in the process and not understanding at all that it is actually them. Hell no. That is another cat in their goddamn territory. Not only that but that trespassing feline appears to be stalking them AND they seem to have some kind of shape-shifting ability where they can replicate the way you look too. And copy your every movement. How can these kittens not act all freaked out and serious at such a threat? Of course their humans watching them have already become accustomed to the witchcraft of mirrors, so they can just watch and laugh. And film it on their phones so other people can also watch and laugh. What Is It With A Cat Looking In A Mirror? 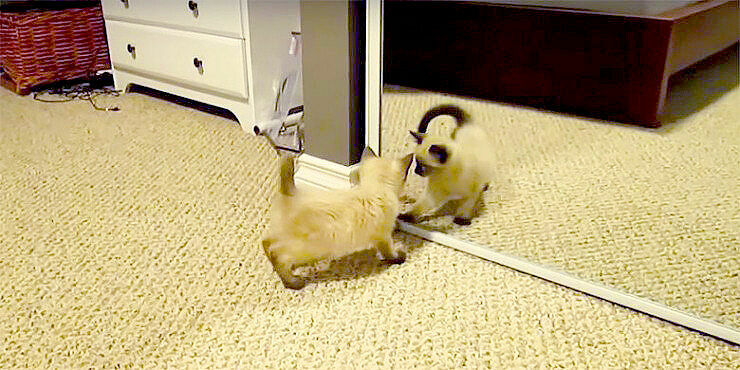 Kitten vs mirror for the first time - Wiske the cat! Poor things, it must be a very unnerving experience, because not only is there a complete stranger in their home, it appears to be mocking them too, mimicking their every move as if to taunt them even further. I bet the kitten's saying to itself, "The weird thing is that this imitating intruder looks a lot like me." There's only on thing for it, ATTAAAAAAAACK!!!!! So kittens of the world beware, 'evil' doppelgangers are lurking behind every mirror. Waiting. Waiting for you. It's almost ranks up there for a cat as them as seeing a cucumber. That's the thing with felines, you never know what's going on in their mind, one minute the love you, the next they want to attack you. But one thing's for sure, a cat looking in a mirror makes for a hilarious combination.